The Sur Menorca Hotel is in a very quiet resort but has plenty of activities and entertainment Couples, groups of friends and families love the wide range of activities and entertainment. Stayed at this hotel from 6-13 September for 1wk with my partner and 2yr old nephew. Chose this hotel as we just wanted a relaxing time and as the reviews for food were good. Hotel was clean and had no problems. Food was ok but really did expect it to be better after reading reviews, sausages and some meat weren't fully cooked and wasn't much choice. Expected to be in very quiet place, but you are really in middle of nowhere, other than a bus ride into punta prima but not a lot there either. Entertainment was ok, did have 4 life acts during week but other 3 nights was rubbish was provided by entertainment team, for the amount of people there and the money that they have paid to come to the hotel they should provide better entertainment. The entertainment team were lovely people but seemed to be trying to do a job with very limited resources. We have just come back from a week at this hotel and have had a marvellous time. 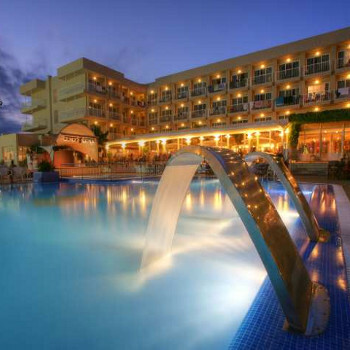 I was a bit wary after reading some of the previous reviews about what we would find but there were no prblems.Admittedley we were there out of season but the hotel was over half full and there were plenty of sunbeds and space around the pool without having to fight for somewhere to relax. The evenings entertainment was ok but not my sort of thing but they have to be given creditfor the fact that they put something on and tried to keep people entertained, a lot of places stop the entertainment when the summer season stops, we had a live act on three of the nights but the animation team worked very hard the rest of the time to keep you entertained. One thing though. considering we brits abroad have a reputation as beer swilling idiots why were the animation team making people do drinking competitions and performing stripteases to music when there were kids around?? I know some people will be reading this thinking that you can't make anyone do anything but they wouldn't take no for an aswer from some people. The food was of a high standard and typical of an all inclusive buffet menu but always fresh and good quality and we had no complaints and one of our party is a very picky eater. My only gripe would be the flies there's loads,but it's like that all over the island. The rep Tanya however could've asked before she sprayed half a can of fly spray in your face and started an asthma attack off.Mind you that's one persons actions not my opinion of the whole comany or place. it's a great winter holiday destination the only reason I wouldn't go in the summer is that the temperature apparently get into the 50's and I can't cope with it that hot.Otherwise definitely will be going again. The hotel is pure'Brits abroad stuff'. The hotels was clean and the food- well i've had worse. The hotel falls on its sword though with the pool. Its far to small and there are not enough sunbeds. The hotel is AI, so not many people leave its grounds. When you get a bed, then you just lay back in this hell hole and watch sunburnt Brits in footbal shirts chucking larger down their necks while the kids turn the pool into a riot. My son (10) loved it. Stayed at the Sur Menorca for 1 week at the end of July, our first impression of the hotel was very good with a large reception area and a quick and friendly check in. We stayed in the main block which was a little bit disappointing, the rooms are quite small with a small bathroom and shower cubicle, not great with 2 small children. The only blessing was CBeebies on the TV!! Having said that it was clean and the maid service was very good with towels changed daily. After a disappointing fist meal in the restaurant, thankfully the choice and standard of food improved as the week went on. We enjoyed the Paella and there was always fish, chicken, pasta and salad to choose from. The snacks were very poor though, not much choice and only available in just 3 half hour slots throughout the day, also you weren't able to take food from the restaurant. We have experienced several all inclusive hotels & we've found that snacks are normally available all day. There is also only 1 bar open by the pool and we were lucky if there were 2 people serving, hence long queues for much needed drinks!! The entertainment team worked hard day and night, there was plenty for the kids and the adults during the day plus a kids disco every night followed by games or an act. The entertainment area is a bit of a joke though for a hotel of this size. Not only is it tiny but it's also right next to and facing the pool, not very safe with small children running around!! We spent most days around the quieter kids pool which is at the rear of the complex behind the bungalows, this was a lot quieter and safer for young children. The hotel is actually in a place called Biniancolla about 2 miles out from Punta Prima, it's about a 15 minute easy walk into the resort which is very clean and has a nice beach. For a day out we can recommend trips to Mahon or Cova Den Xoroi near Calan Porter, this is a bar/nightclub built into the cliff side with stunning views out to see and a great chilled out atmosphere. Apparently it's the place to go in the evenings but no kids aloud so we had to make do with a daytime visit, still enjoyed it though. Probably would stay at his hotel again but only if we could get a bungalow or apartment. We chose Sur Menorca for our honeymoon and we were slightly disappointed. The hotel was clean and staff were all happy and helpful, but we didn't realise how far out we were from any towns. When we were there it rained most of the week which we were told was very unusual, even though it could not be helped. We were slightly out of season so activities were limited. I don't think they were very prepared for rain, as one night we were to have african acrobats preform outside so they moved them in and they ended up hitting their heads on the ceilings. Lining up for drinks took quite long but the bar served quickly. Food was very good but eating the same thing for a week gets a bit boring so we ate out a few times in Punta Prima. The snack bar was only open 3 times a day for 45 mins at a time and were mainly toasties which were nice first of all but there's only a certain amount of toasties you can eat. They served hot dogs about 4 times and chips about the same. Not what we were expecting. If we were to go again we'd remember to take our driving licenses, car hire is the best way to go. In Punta Prima they rent out dune buggies and quads if you'd rather not be stuck in a car. The free bus to Punta Prima was great. Punta Prima was beautiful but very basic, just a few shops so you would need to go into Mahon if you really wanted to go shopping. There is a bus station right outside the hotel which was very helpful and we were quite shocked how cheap it was but get in line early because you'll be left standing up squashed up against the windows. I stayed in this hotel at the same thime rachel and robert did.